While many taco trucks park on the city streets wherever a space is available others find a permament home on driveways of other business’s and empty lots. 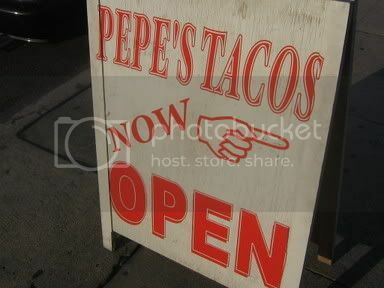 This is the case with Pepe’s tacos on West Adams. A taco wagon that sits on a lot next to an auto mechanic. Pepe’s has quite the setup with a tent that covers tables and chairs. There’s also a wooden sign set near the sidewalk and a large sign above the wagon that reads "OPEN". The cook (maybe Pepe?) wears a Pepe’s tacos hat, the girl behind the counter young enough to be Pepe’s daughter takes the orders. I order asada and al pastor and a tamarindo. With the heat the tamarindo is like an oasis in the dessert, so refreshing and sublime. I drink it down fast and order another. 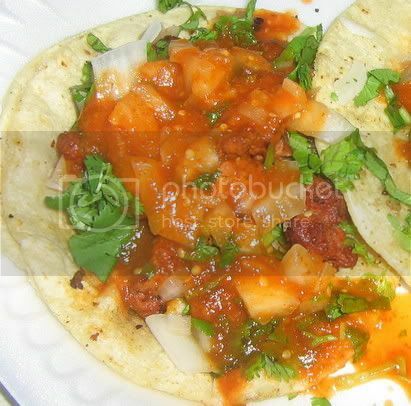 My tacos come with onions, cilantro, and a spicy salsa with an orangish tint suggesting habanero chiles in the mix. But the salsa is so complex and well prepared I can’t pin down the chile mixture. Possibly a secret recipe of Pepe’s. It’s outstanding nevertheless. The asada charred and packed with flavor,the warm grease from the meat soaking into the tortillas combined with the salsa roja makes for a delicious taste of chile,beef and toasted corn. The al pastor has a tandoori-like flavor to it. It takes my taste buds a bite to adjust to the unexpected flavors but once I do I’m dancing. The pork is devoid of it’s porkyness and replaced by a heavy spice rub of cumin and achiote. And that’s what made Pepe’s different. It wasn’t your standard taco wagon pumping out generic tacos. 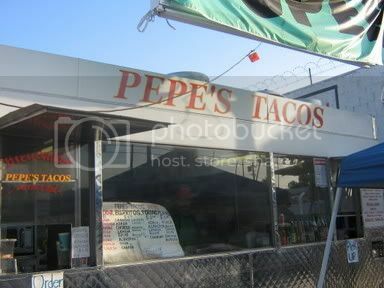 They were Pepe’s tacos. I finished off my tacos and the rest of my tamarindo but the sun and the salsa and the heat started to get to me. The sweat on my brow fell into my eyes, the salsa roja filled up my cheeks like determined bees poking into a pot of honey. I reached for my cup of tamarindo but it was all but gone. It was overwhelming for a moment, the heat from the sun and the salsa and the panic.I wanted to jump into a pool of tamarindo and do the backstroke and swim through the ice cubes. But as the seconds went on I reveled in the heat. I let it overcome me.The sweat dampened my hair, my shirt, my mind. I closed my eyes and thought of my youth running through the blistering summer sand of Santa Monica beach and jumping into the white wash of the pacific. I gave in to another tamarindo, this time compliments of the house (or wagon)and crunching the ice and chugging down the sweet elixer I got back into my car heading west, another taco truck under my belt but so many more on the horizon. Man, am I going to have to quit eating all other things? I loved your description of the heat reminding you of your childhood and running around on the beach. I'm always trying to come up with grandiose metaphors to describe food to people. Very lyrical and inspiring post, Bandini! Dude! Nice work. I am a longtime taqueria enthusiast writing you from the storied Mission district. Your site, my man, is the kind of thing that redeems the internet and your site, my man. Please put me on your mailing list, or whatever (alpastor@hotmail.com), and keep up the good work. Can't wait for my next trip south. What do you like Armenian-wise? This is true devotion to your taco-finding calling, to weather the intense heat wave here in socal in pursuit finding great tacos! Hunt ON! My friend Jeffrey Clark turned me on to your fine blog. I must say, your dedication to the holy pursuit of the taco grail is admirable, and I plan to avail myself of your research in my next trip down to the Southland. 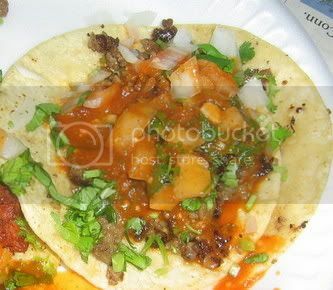 Here in Sacramento we have some decent taco options, from taco wagons to small chains like Beto's, Carolina's and Adalberto's, not to mention the many taquerias. Keep up the good eatin'! I love you Bandini!! What a great concept for a blog! 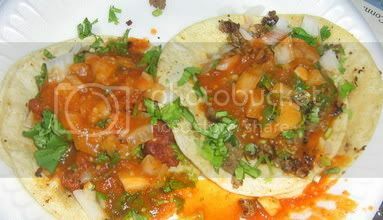 I'm originally from here but have lived out of state and there is nothing comparable to LA tacos. Nothing! With all of these tacos you consume per week, which do you prefer: tums, rolaids, or pepto?